From its humble beginnings as a computer parts store in Beijing, to its rise as an e-commerce giant, Richard Liu has led JD.com the entire way. The Founder and CEO has been with the company since its inception in 1998 and has seen it grow rapidly, becoming China’s largest online retailer and biggest overall retailer — covering a population of more than 1 billion. Richard Liu was two years out of college when he decided to start his own business. With a degree in Sociology from Renmin University, Liu spent some time in the restaurant and health product industries before deciding he wanted to venture out on his own. Liu, wanting a better life for his family, spent the last of his savings to start Jingdong — a computer parts store. Liu leased a small, 4-square meter space in Beijing’s technology hub of Zhongguancun and opened a store selling magneto-optical computer parts. The store went on to expand to 12 stores by 2003, but the SARS outbreak put the future of the company at risk. With customers and staff forced to remain housebound, Liu took his business to the Internet. Liu left the brick-and-mortar business and entered the e-commerce world in 2004, and JD.com was born. It was just one year before Liu shuttered the stores and focused all his energy to his online business where he sold myriad quality consumer goods alongside electronics. Over the years, JD has expanded and now offers customers a vast selection of products including fresh food, electronics, clothes and so much more. The people of China have grown to trust JD.com due to its strict policy against counterfeits and its reliable same or next day delivery service. With a nationwide fulfillment network, Liu has made it possible for people throughout China to shop for the products they need at consistent prices — something not available before JD.com. 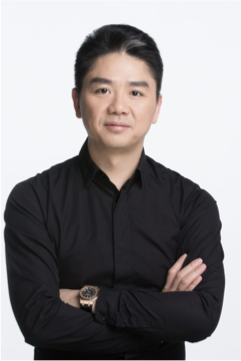 In addition to providing an innovative online shopping experience to the people of China, Richard Liu led JD into strategic partnerships with WeChat and Walmart. Additionally, Liu was responsible for JD becoming the largest Chinese company initial public offering in the United States at the time it started trading publicly on NASDAQ and becoming the country’s first Internet Company to be listed on the Fortune 500 list. Richard Liu has said he works 16-hour days and is focused on getting JD to become a globally recognized brand and continue to make a positive impact in the community. Just this past year, Liu has put into place programs such as a new philanthropic initiative is called “Creating Happiness Together,” with the goal to raise money for World of Art Brut Culture, a Shanghai NGO devoted to supporting special needs individuals through creative art therapy.